Cutting the cake is always an interesting part of every wedding. Some couples are very kind and easy with each other. They hold hands very gently, look into each other’s eyes, and slowly put the cake in their mate’s mouth. Others, will hold hands, cut the cake very gently, and look into their mates eyes, thinking; will they smash the cake into my face? I remember many, just as if it was yesterday. However, a few stand far and above the others. There was one couple where the groom was taunting his bride. He had a big smirk on his face and there is no doubt he wanted to smash the cake all over her face. However, she looked back to him and without saying a word, he knew better than smash the cake. Many times, the bride doesn’t want her makeup or dress covered with cake and icing. Other times, it is because the bride is very shy and would rather this simple moment end quickly. Often the cake cutting starts very nice and civil but ends up as a food fight. Some state that the original wedding cake cutting/smashing of the cake goes back to Roman times, when the groom would smash part of the cake over his bride’s head for some symbolic reason. If this is truth, then I am glad it ‘evolved’ to today’s tradition. Two food fights stand out in my mind. Both couples started the caked cutting very nice but you could see the look in their face that both the bride and groom had something else planned. I was attempting to watch both through the lens to see who would strike first. (My assistant was opposite me to ensure we captured as many angles of the cake cutting as possible.) In a blinding split second both the bride and groom (not to be outdone by their mate) pushed the cake into the face of the other and then the cake started to fly. 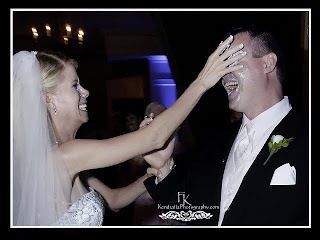 They were laughing and anyone within a few feet of the couple had cake all over them. It proved to be a fun and festive cake cutting. Cake cutting is another reason why I am passionate about wedding photography. 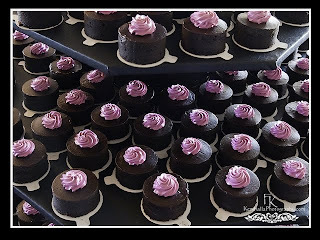 There is no doubt many of the couples will be showing their wedding album to their children or grandchildren and a little smile will develop as they think about their special day and their first piece of cake together as a couple.